• First edition hardcover (pictured at right) published 1988 by The Atlantic Monthly Press. Jacket design by Chip Kidd; jacket illustration by Andrew Paquette. This edition had a single printing of roughly 4000 copies. • Mass market paperback published 1989 by Warner Books. Cover design by Barbara Buck; hand lettering by Michèle Brinson; cover illustration by Bob Zuba. • Trade paperback reprint published 1998 by Grove Press. 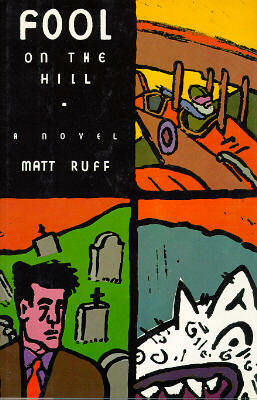 Cover design by Charles Rue Woods; cover illustration by Clifford Alejandro; cover typography by Miguel Santana. • British hardcover published 1989 by Bloomsbury Publishing. The jacket used a variation of the American cover art with the panels rearranged and a white rather than black background. • German-language hardcover published 1991 by Carl Hanser Verlag. Translation by Ditte König and Giovanni Bandini. • German-language trade paperback published 1993 by Deutscher Taschenbuch Verlag. • Polish-language trade paperback (pictured at left), retitled Glupiec na wzgórzu, published 1998 [?] by Prószyński I S-ka. Translation by Ewa Gorządek. Cover art by Ryszard Ronowski.